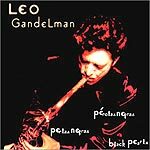 Unless you're from Brazil or an absolute fanatic about Brazilian music, you've probably not heard of Leo Gandelman. But if you dig smooth, jazz-based pop music along the lines of Bob James or Spiro Gyra, then Gandelman is one of the best. He's possessed of a nice, warm sound on tenor sax, and the songs all bounce in a light, inoffensive way. It's somewhat of a letdown that there isn't more of a Brazilian feel to his music, a bit more of a modern Latin backbeat or even a touch of now-dated bossa nova. It's even more surprising given that the album was recorded in Brazil, and that most of the compositions are by major Brazilian songwriters  including names known even in the United States, like Milton Nascimento and Djavan. Still and all, this is a fairly romantic album, a nice mood-setter when the fire's crackling and the wine is cold.